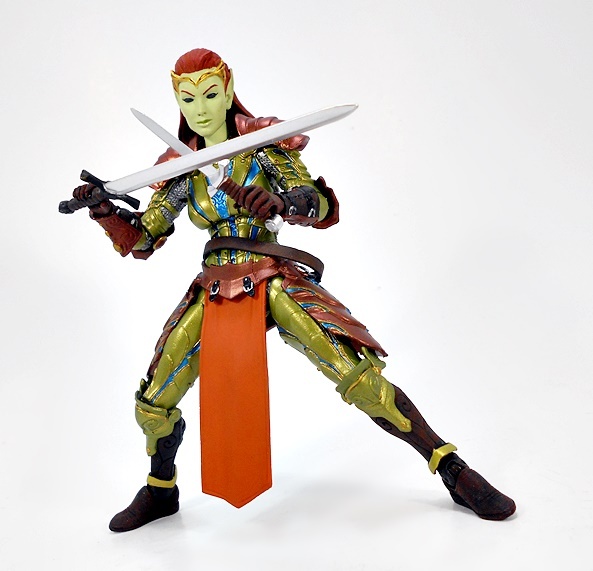 It’s another Mythic Legions Wednesday and time to turn my attention back to that most noblest of races… The Elves! Today, I’m checking Myria Goldenbranch, who hails from a place in Mythoss known as Whispervale. She’s a special kind of Elf, known as a Whisperling, and imbued with the power to draw magic from the very trees around her! 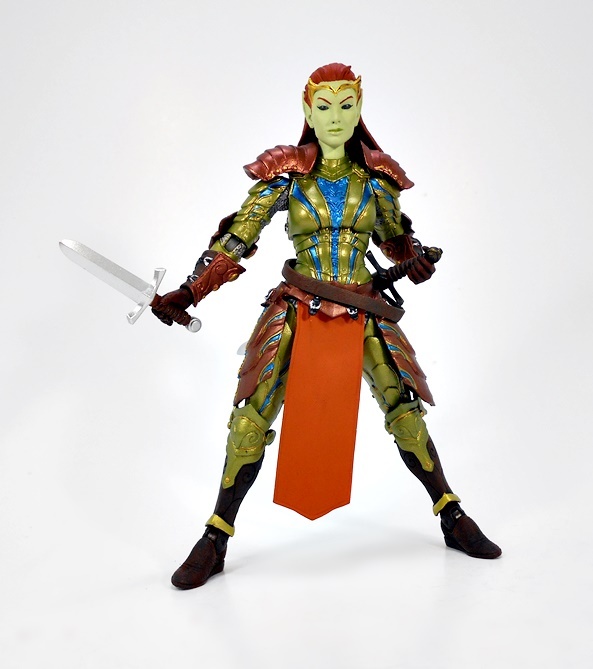 And here’s a She-Elf that can enchant my forest any time! The bulk of Myria’s armor comes from the standard female knight body that was introduced with Gwen Heavensbrand. This includes the torso, the upper arms and upper legs, and the hip piece. 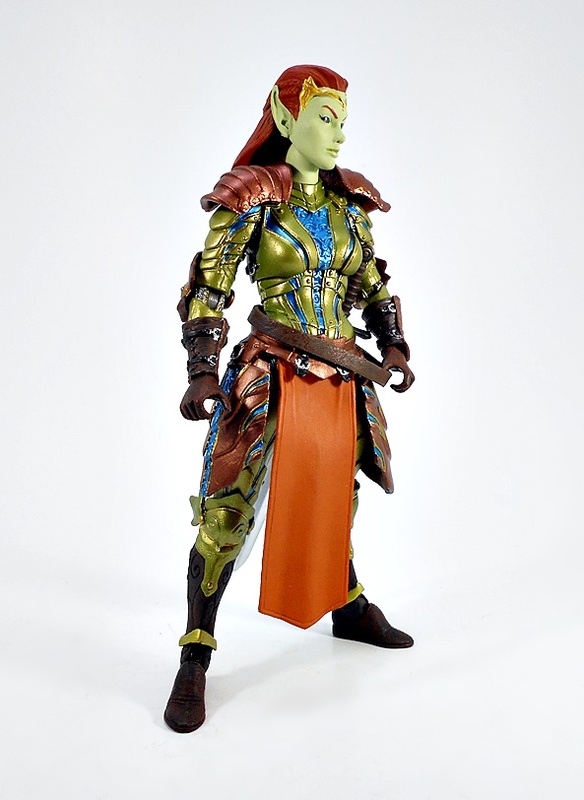 The plate armor is given a little bit of a lighter touch with the elf bracers for the lower arms and the boots, which are sculpted and painted to look like leather with reinforced plates on the knees and around the ankles. 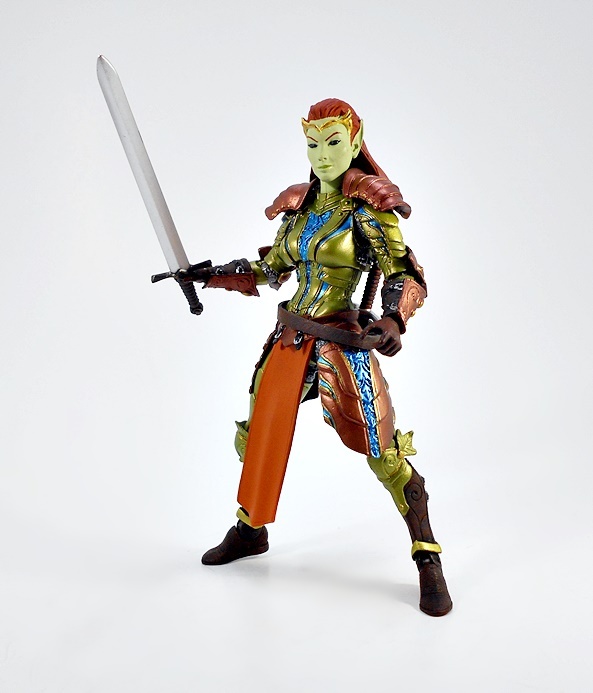 Instead of the crotch plates, Myria gets by with the lower tabard piece, which is sculpted in soft plastic. This is the only part of the figure that doesn’t quite work for me. 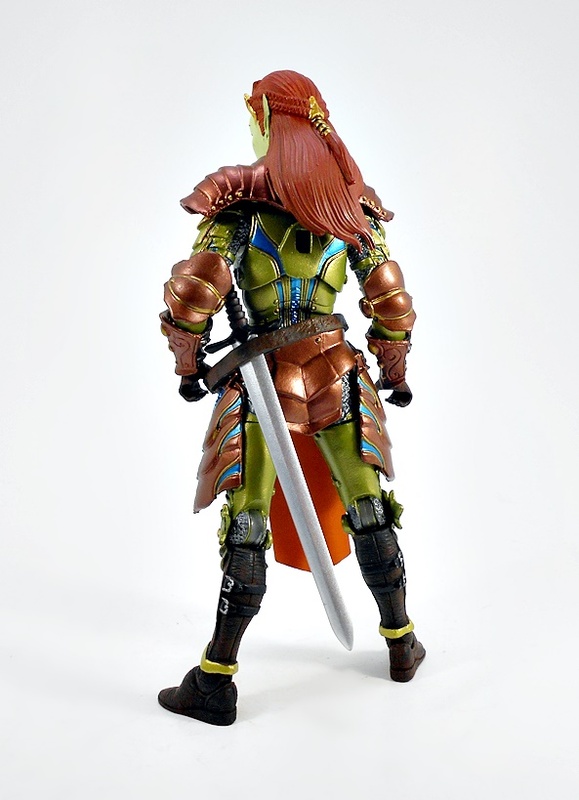 I’m not sure if it’s the color or not, but I would have rather they used the leather scale armor piece here instead. 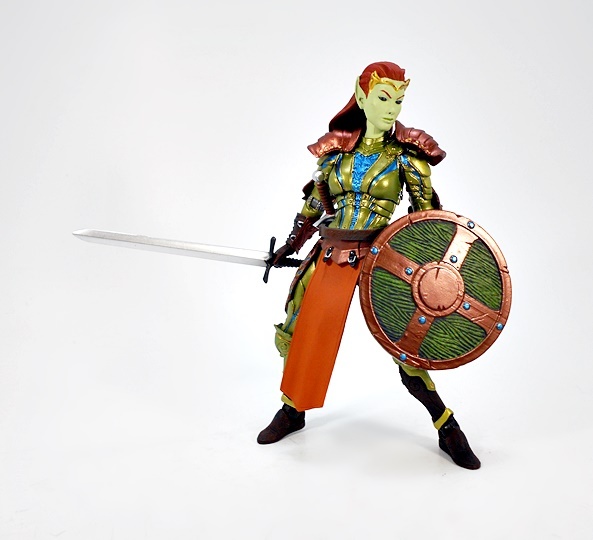 But, because Mythic Legions is totally modular, I could always borrow that piece from another figure and make the change myself! With nothing fresh in terms of armor pieces, much of Myria’s wow-factor comes in the form of the new deco. 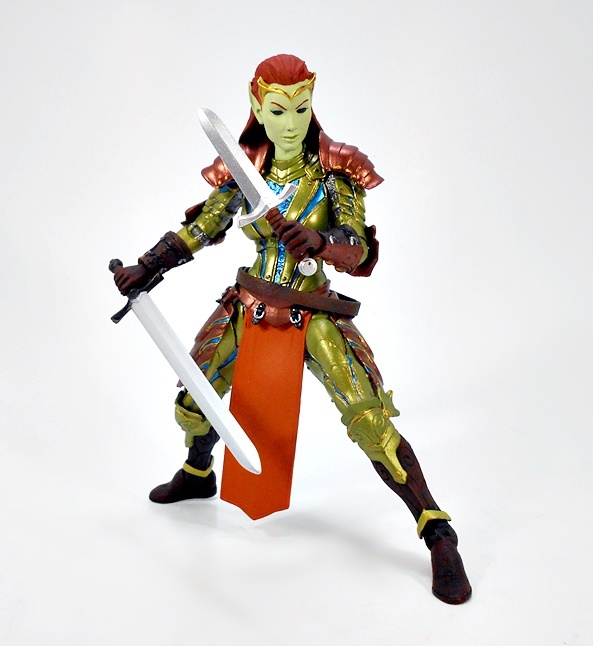 Not that the sculpt isn’t fantastic, but we’ve seen it before, and I’ve gushed over it many times. Instead, I’ll just spend some time gushing over the coloring here because I absolutely love it. 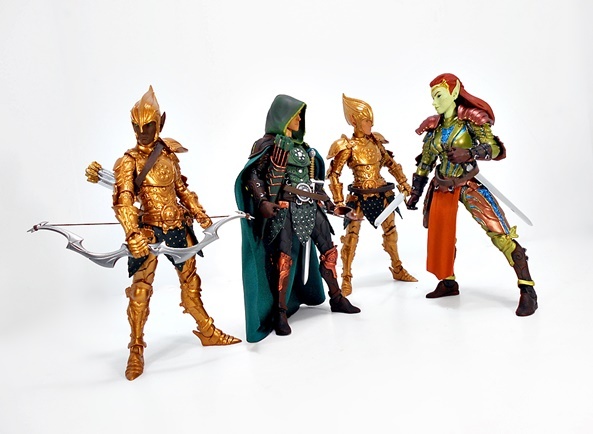 I wouldn’t have thought to pair the metallic green with electric blue, but I’ll be damned if it doesn’t look fabulous together, especially when that rich copper coloring is tossed into the mix. The deep brown used for the boots and gauntlets does a great job simulating leather, and I never cease to be impressed at how all the little sculpted straps are painted along with their fixtures. The exposed chain-mail in the joints is painted silver, and there’s some fine gold edging done along the different sculpted plates in the armor. While the neck down may be a case of been there, done that, Myria does sport a brand new head sculpt and it is very nice, indeed! She has a pale green complexion, which may or may not be the norm for the Whisperlings, with green lips, and pupil-less ebony eyes. The eyes would probably look horrifying on any other figure, but here they just make her look more mysterious and exotic. 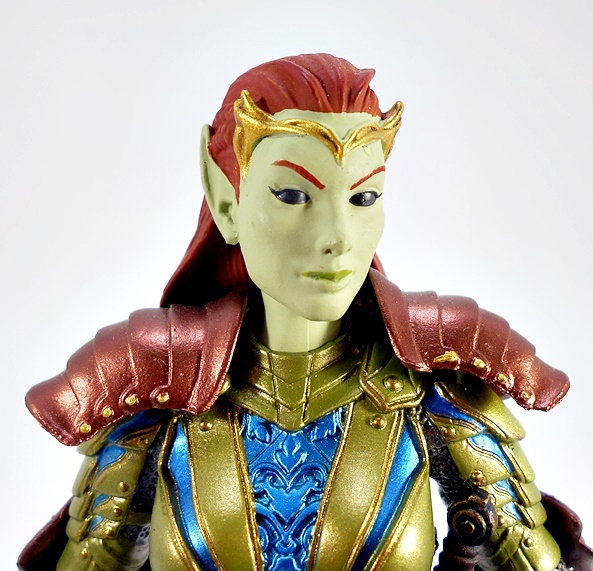 Myria features a gold tiara sculpted as part of the portrait, as well as long red hair, which falls back down her neck and leaves her long pointed ears exposed. 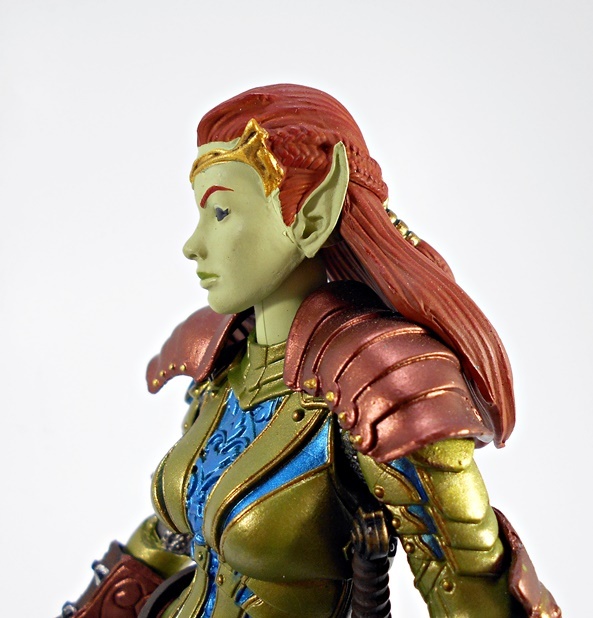 In the back, her hair is sculpted with two sets of braids that join together in a golden clasp, similar to what we saw with the Elf Ranger. 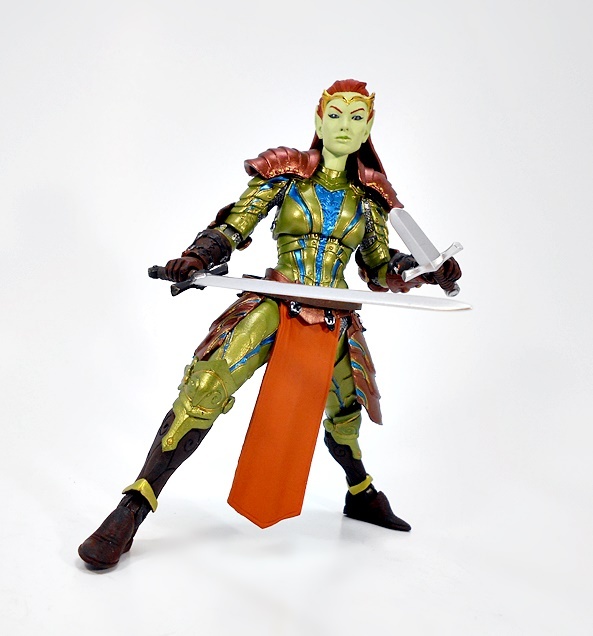 As great looking a figure as she is, Myria comes up really short when it comes to her accessories. For starters, she’s got the usual basic sword and dagger, which we’ve seen too many times to count now. And yes, this is the point where I say that no matter how many times we see these, I still love them. The problem is, these are the only two weapons she comes with, so recycling the most common ones feels like a poor choice. 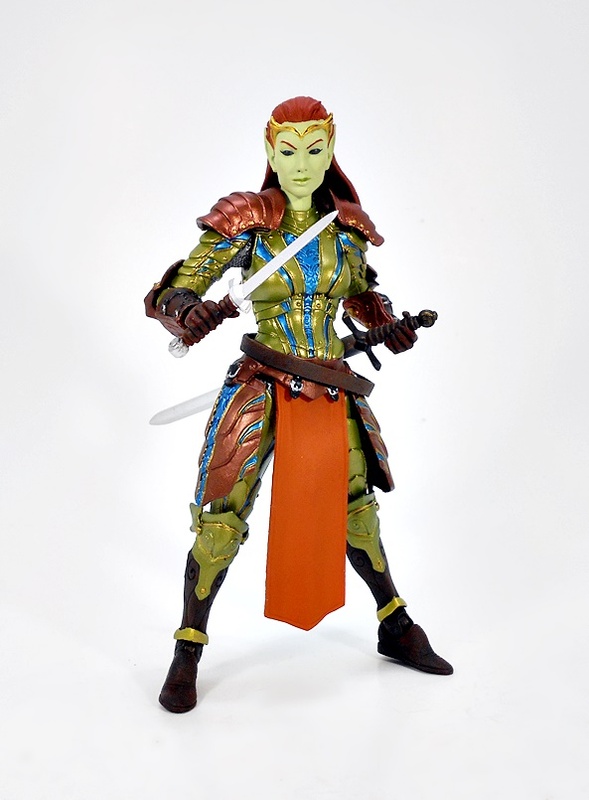 I think she would have been better served getting a repaint of that curved dagger and scabbard we’ve seen a few times already. Or to go one further, since her bio points out that she possesses magic abilities, maybe a staff would have been a good idea. And I’m not even talking about instead of, because by every accounting, Myria’s accessory count is low. The only other thing included is this shield. 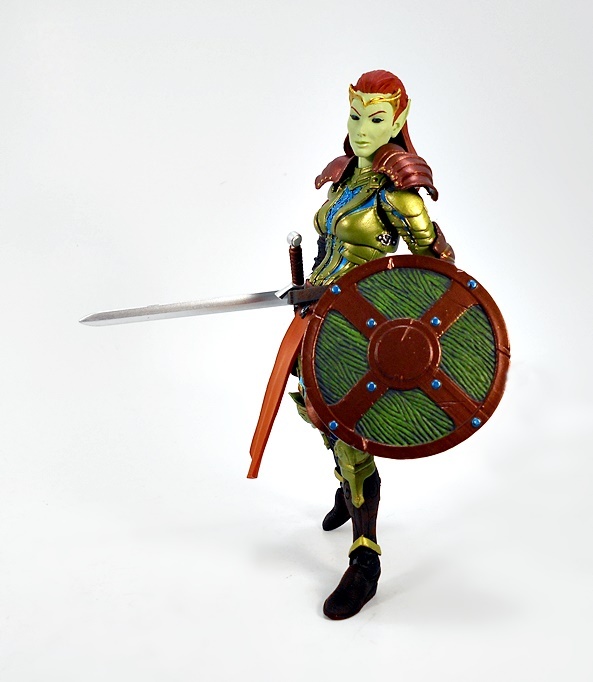 It’s definitely one of the less common shields in the Mythic Legions armory, and I think it suits her well, but at the same time, why not give her the Elven shield. We actually haven’t seen it here yet, it’ll be in an upcoming review, but that just goes to show how uncommon in is. Whatever the case, this shield is a great looking piece, with the wood finish painted green and the frame and edges painted copper, and the rivets painted blue. I know some people who passed on Myria simply because of her low accessory count, and while I can certainly understand that. The pre-orders are a crazy time when you have to really crunch numbers and try to get the most for your money. Still, I’m glad I didn’t count her out. 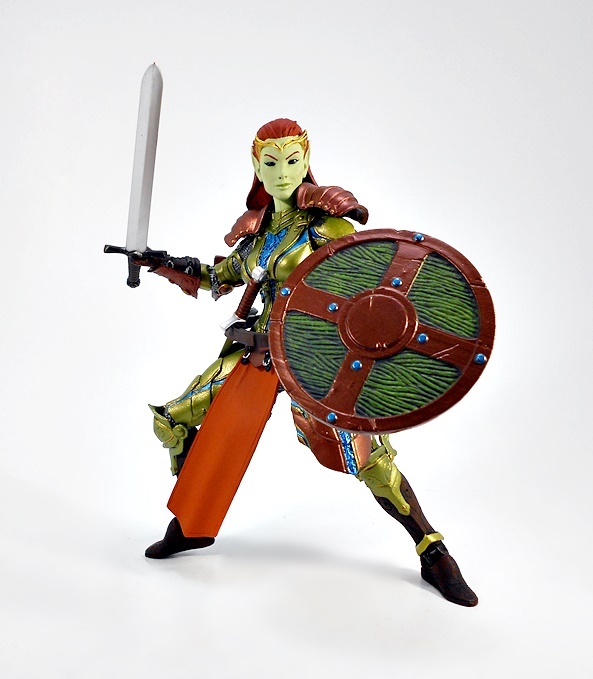 I stand by what I said about her accessories, and I think just one more carefully weighed item like the Elf shield or a magic staff would have gone a long way. But in the end, she’s a beautiful figure and her bio makes her sound like a cool character. In my collection, I’ll probably have her hanging out with the Silverhorn folk more than the Elves, as some sort of Emissary. 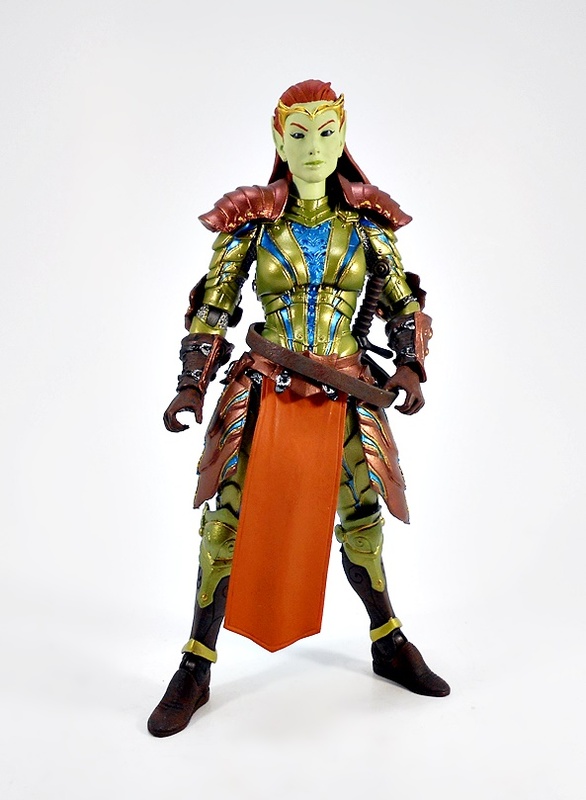 If anything, she makes me wish I had picked up the Elven Weapons Pack so I could have kitted her out better myself.